It was a painful experience that recurred over a number of years. I'd wake up, switch on the television and find Australia on approximately 165 for 1 on the first day of a Test match. 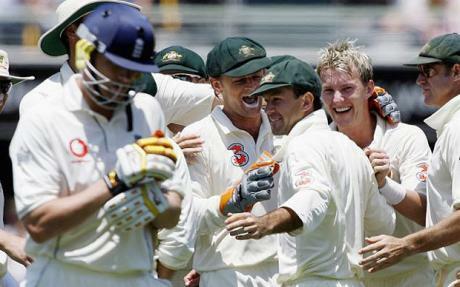 By the end of the day, typically, the team would have put on something like 350 for 3, with Ricky Ponting 85 not out. On the odd occasion when early wickets fell, Adam Gilchrist or Andrew Symonds hit a run-a-ball century and the home team would get to 400 before the opposition fully understood the balance had shifted. Then, McGrath, Brett Lee and Warne would use the pressure of that first innings total to squash visiting batsmen. It's all different now. Missing an established opening pair, and with middle order stalwarts out of form, Australia typically lose half their side before hitting 200, and it's left to Hussey to play the kind of role VVS Laxman did for India before Dhoni's emergence, and Steve Waugh adopted during the early phase of Aussie dominance (though Waugh, typically, took a tally from big to enormous, rather than from meager to respectable). Out in South Africa, India can only pray for more rain after the first day of the first Test. I didn't watch any part of that match because it's on a new channel called Ten Cricket. I've already paid for Ten Sports, and now the firm has shifted some of its previously acquired and advertised properties to a new channel and is charging separately for them. How is this allowed? There's also a channel called Ten Action which I can't get because TataSky has a problem with it. There's no point asking any customer service chaps what the issue is, they don't know, or won't tell. Ten Action was previously Zee Sports; TataSky cut deals with every Zee channel except Zee Sports, and the stalemate has evidently continued after the channel's change of name. Ten Action broadcasts La Liga, which means I miss watching the two best football teams on earth. On the bright side, it also means I get a little more sleep. I completely agree with you on Tata Sky and Ten Cricket business. At least, Tata Sky is offering Ten Cricket free of charge to 'Sports Bonanza pack' subscribers. However, you have to specifically opt for it. They won't charge you till Jan 23 (when the tour ends). So I have to remember to unsubscribe it on 24th!! But as far as I can tell, if you've paid in advance for some other pack, you're stuck. Studied English literature. Reviewed films. Scripted a bit. Edited a magazine. Worked in a dotcom. Lectured on art. Wrote a column.